In this chapter we deal with perturbations whose influence is concentrated outside of the domain of essential self-adjointness of the free Hamiltonian. 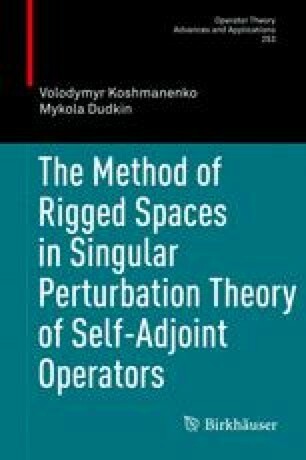 We show that the extended rigged spaces method is applicable to such perturbations. A new step is the introduction of the scale of Hilbert spaces and involving in the consideration the unperturbed operator in some power. This allows one to treat perturbations with any order of singularity.